With African designers are now settling permanently in their design roles globally and the words ‘African fashion’ are encrypted on virtually anything on the Lagos streets, the meaning of ‘African Fashion’ seems to be lost in the in the fake batik especially as regards its origins. The recent past has seen major European designer labels contain the word ‘Ankara’ fabric ranging from tennis shoes to short shorts. The number of African designers who are bringing to fore the African heritage and tradition is increasing with more edgy designs. So what makes a design African? Does the fact that a designer is African make their designs African? Could Oswald Boateng be African design? Do ‘ankara’ print shorts by Boxing Kitten qualify to be African designs? Could participation at major events like Arise Fashion Week and African Fashion Week New York provide approval for being an African fashion? Most of these platforms come up to provide platforms for which talented Africans would find opportunity to showcase their talents which would otherwise remain buried and un-recognized by big outlets. This seems to justify that as long as the designer is African, then their designs are African. But then there remains the question of the design itself, does it matter if the product is traced back to African history, social scene or even marketplace? Consider a case where a European tailor makes an African design, would it be considered African and what about if the reverse is true? What is African? While this question still finds answers in the products and projects that have this label, it is important that the opportunities that come with the label ‘African’ are harnessed to enable meaningful change on the continent. Given there is so much energy and resources by the youthful generation who are out to do rebranding and remaking of Africa, African fashion would be a major ingredient in such efforts. Even with the ‘ankara’ fabric being popularly branded as African, it still carries in bold the labels ‘made in China’ and ‘made in Europe’. The lace fabric that has gained much popularity among West Africans for their major events can hardly be associated with Africa. It is in fact manufactured in Switzerland. There has been a tendency of wearing overpriced fabrics just once for the occasion; this may not give room to know that such products do not last beyond the first washing! The most common Ankara and lace lose their beauty and luster just after their first wash, the most expensive may not even last beyond the third wash. In short, most Ankara may not last long enough for one to realize the benefits of their investment. And the plain truth is that Ankara is not African. African cultures are rich in histories of their textile design; there are wax textiles, mud cloths, silk that is hand woven, Ethiopian cotton, beading and embroidery. True African fashion is just infinite! 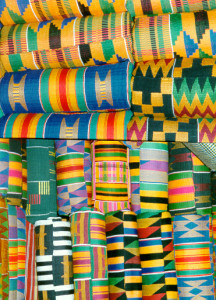 Considering the African methods of producing textiles are worthy of longevity with much color and aesthetics, importing fabric then becomes counter-intuitive. The best of international design have to depend on quality fabrics; fashion is defined by the fabric. African fashion should highly elevate the social, political and economic aspects of Africa. Imagine the African women who sit down and work at their weaves weaving impeccable silk and cotton by hand! They for sure have minimal resources for such work. These women should not suffer with little resources for their families’ food while they produce the most durable of fabrics. Most African textiles collapsed with no much protest. The people in power did not take time to think of the women working on the textile. Although recently there have been efforts to revive the industry, still the African fashion suffers. We lose on the intricacies, the beauty and elegance of the African designs and fabric by working on sourced products.